Pittsburgh, PA (April 1, 2019) – Occupying a commanding position atop one of the Antarctic’s premier glaciers, the single-story dwelling fondly known as The Igloo offers expansive views of the snow and ice of the South Pole and is listed for sale exclusively by Howard Hanna Real Estate Services. The 49-square-foot domicile features one single, icy room with slick glacial walls and glazed ice flooring. Built of eco-friendly compressed snow bricks comprised of the finest organic snowflakes, this artisanal home offers exceptional body heat retention and exquisite, unobstructed views. The open-concept floor plan is designed for the truly daring, with living room, kitchen, and bedroom flowing elegantly within a single space. The icebound home is climate-controlled, with an option of one climate. Outdoor lovers will adore the home’s proximity to wintry activities, including snowshoeing, sledding, and anthropomorphic snow sculpture, as well as convenient access to McMurdo Station. I LOVE IT! What a retirement home this would be for my family! My neighbors would be awesome, Penguins, just majestic cool peeps! I am so very happy Howard Hanna has it for sale! WHEN CAN I MOVE THERE! 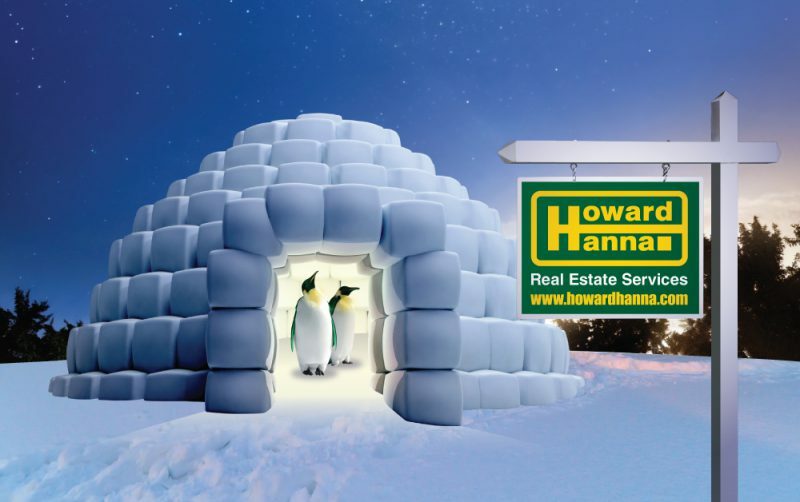 I’ve heard that there is also an igloo in Pittsburgh, home of Howard Hanna Real Estate Services, but that igloo isn’t normally surrounded by snow and ice. It has been known in the past to have ice inside of it with Penguins occasionally observed sliding around on the ice. Hello … All You Green Penguins … Out There! ‘The One … Meant To Be … Your Next Home’!